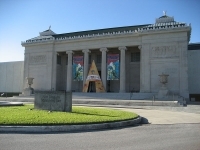 The New Orleans Museum of Art (NOMA) is a world-class facility. The permanent collection at the museum features over 40,000 objects, from the Italian Renaissance to the modern era, and is celebrated for its collection of both American and European works, including art by masters like Degas, Matisse, Rodin, Jackson Pollock, Monet, Renoir, Georgia O'Keeffe and Picasso. The museum sits in the lovely City Park, surrounded by ancient oak trees and lagoons. There is also a small amusement park and Storyland, a charming fairytale playground, in the park to help amuse younger travellers. One of the most impressive parts of the museum is the superb Sydney and Walda Besthoff Sculpture Garden. The Sculpture Garden provides a unique opportunity for visitors who treasure the arts, with a varied collection of modern and contemporary sculptures presented in an exquisite natural setting. Opening times: Tuesday to Thursday 10am to 6pm; Friday 10am to 9pm; Saturday 10am to 5pm; Sunday 11am to 5pm; closed Mondays.